This info comes from Geoff the Grey Geek site. Decibels are widely used in audio, and often misunderstood. These articles give a practical understanding on using decibels in audio work. But first, some basic questions and answers about decibels. A decibel is a tenth of a Bel, a unit of level, named after Alexander Graham Bell. A Bel is a very large unit, so the prefix deci (one tenth) is used. A decibel uses a logarithmic scale, not a linear scale like volts or watts – see below. There is no absolute level called a decibel. A decibel is a ratio. It is relative to something. Unfortunately what it is relative to is often not mentioned when stating a decibel reading. For example, a washing machine might be said to have a loudness of 70dB, this usually means the noise it produces is 70dB higher than the threshold of hearing (0dB). So why use a decibel? You might have noticed that the volume control on most HiFi amps is marked in decibels, as is the markings on mixer level controls. This is because our range of hearing is so vast, that to use a linear scale we would be using figures from 0 – 1,000,000! A secret to understanding decibels is to note that decibels are non linear. Another example of a non-linear relationship is between the side of a square and the area of a square. In this example, you can see that increasing the side measurement does not have an equivalent increase in area, but a larger increase. Also a doubling in the side length does not double the area – it is a lot more than the double! This is an example of a non-linear relationship – in this case, a small increase in the side relates to a differnet increase in the area. Decibels are similar. A small change in decibels relates to a different change in the ratio of the two levels being compared. Example One: you increase the volume on a mixer or amplifier by 6dB: this is actually doubling the voltage that will appear at the output (because 6dB is a factor of 2 – see table). So we could say the level is now +6dB, That is, relative to what the level was, it is now 6dB higher. Remember decibels are always relative to something, in this case, to what it was before we doubled (added 6dB to) the level. Example Two: same scenario, but this time we lower the volume by 6dB. This means we are halving the voltage (because 6dB is a factor of 2). So we could say the output is now -6dB (below what it was before). These examples also show that it is possible to have positive and negative decibels. If the voltage is +6dB, it is twice the size as it was before. If is it -6dB, then it is half the size it was before. I know it can be hard, but stay with me here, a few more examples should help. Let’s say we have a microphone that is giving out 1 millivolt (that is, a thousandth of a volt) when we speak into it. We plug this microphone into a pre-amp (microphone input on a camera or mixer) that has a gain of 60dB. From the table above, we see that 60dB is equal to a linear ratio of 1000. Therefore a pre-amp with a gain of 60dB is going to amplify our 1mV mic level signal by a factor of 1000, giving us a level of 1,000 millivolts or 1 volt. Behold, we now have a signal which is at line level (see article on Audio Levels). Consequently, we could say that the level of the microphone signal is -60dB compared to the amplified line level. That is, the input is a 1000th of what the output of the pre-amp is. In practice, most microphones will produce about 10 millivolts (when spoken directly in to), so the signal only needs to be amplified by a factor of 100 to make it up to 1 volt (0.01 x 100 = 1.0). The table above tells us that a factor of 100 is 40dB. Most mic pre-amps should amplify the signal by at least 40 dB (x100) and some will amplify up to 60dB (x1000). Some video cameras (semi-professional or professional) will have a switch which allows you to switch the gain between 40dB, 50dB or 60dB gain for the preamp. The other way of stating this is to say the input is selected for -40dB, -50dB or -60dB levels. Just remember it is all relative, and the greater the number, the greater the amplification. Have a look at the manual for your HiFi, mixer or video camera, and find out what level your mic input it expecting. If you are putting more in, it will probably cause distortion. If for instance you are trying to connect a mixer (PA board) tape out, into your mic input, what do you need to consider? Well, first we need to know what the output level is likely to be. Let’s say that the specifications say the tape out (line out) is -10dBV or 316 millivolts and your mic input is looking for -50dBV (or 3.16 millivolts). This is where decibels makes it easy. We have a level of -10dB, and need to get it to -50dB, easy, use a 40dB attenuator to reduce the level. That is easier than calculating the ratio between 316mV and 3.16mV, (which when you calculate it happens to come to a linear ratio of 100 or a logarithmic ratio of 40dB). Decibels do make calculations easy, but it can be difficult to comprehend. In the first article we saw that a decibel is not a fixed unit, rather, it is a ratio between two levels. A decibel reading on its own is meaningless if it isn’t referenced to something. Unless it is spelled out, that reference something is normally 0dB. The mic input on a camera or mixer might say -50dB, that would mean it is 50 dB lower than 0dB. The line out of a mixer or DVD player might be -10dB, meaning it is 10dB lower than 0dB. The stereo out of a mixer might be +4dB, meaning it is 4dB above 0dB. In simple terms, 0dB is the reference level. It is the level that is being referred to. When the measured level is neither above or below the reference level, then the difference in level is obviously zero, hence our reference level is called 0dB. So what is this level? In most situations with audio, 0dB will refer to Line Level. That is, the nominal level that comes from a mixer, keyboard, camera, or DVD player etc. What level is Line level? This is the $64,000 question, because there are various levels that are referred to as line level. A good specification table for a camera, amplifier, mixer or recorder will always say what voltage level they are using as 0dB. There are several conventional line levels that can normally be used if no other information is stated. The secret is to pay close attention to the letter after dB. 0dBm refers to 0dB also being 0.775 volts, but the power formula for decibel calculations needs to used, meaning 1dBm is close to 2dBu. Don’t get too bogged down in all this, just make sure you compare apples with apples. That is, if you are looking at two cameras or recorders or mixers and comparing the microphone input sensitivity, make sure both specifications are dBV, or both are dBu or dBm. Before we look at some real world examples, we need to appreciate that 1 volt is a high level for line levels, and not commonly seen in consumer electronics. The “standard” line level in consumer electronics is normally -10dBV, which is 316 millivolts or 0.316 volts. That is why the tape out of a mixer is often -10dBV. The same level is used for line in on digital recorders, TVs, VCRs and cameras with line in. The popular Panasonic GS500 (similar to most cameras) states that the audio output level (line) is -10dBV (316mV). This is good because this matches the standard consumer line level found in VCRs and TVs. So when we plug the line out from the camera into the line in of a recorder or TV, the levels match and all sounds good. -50dB (0dB=1volt)”. Knowing the reference is 1 volt, and that 50dB is a ratio of 316 (see table) we can calculate the mic input is expecting 3.16 millivolts (1 divided by 316). This is about the level from a normal microphone so all will be good when a microphone is plugged in. When a sensitive or high output microphone (eg Rode Videomic) is used, it is useful to reduce the output on the microphone so as not to overload the camera input. Hence most users switch in the 10dB attenuator on the Rode Videomic. A common mixer used in churches and schools is the Yamaha MG series. Its specifications are also representative of many mixers. A quick glance at the specifications reveal both dBu and dBV are used. However at the bottom of the page, they do conveniently state that 0dBu=0.775 volts and 0dBV=1 volt. They also helpfully give the equivalent voltages alongside each dB value. Let’s look at some of the specifications that will interest us if we want to connect to a mixer output. The stereo out has a nominal output of +4dBu (1.23volts) with maximum +24dBu (12.3volts). It should be obvious that we shouldn’t connect this straight into the mic in on our camera! If we need to connect to this output, we would need to reduce the level by at least 50dB. The better output might be the tape out. The specifications state “Record out: -10dBV (0.316 volts)”. This is closer to -50dBV (3.16mV) but still 40dB higher than nominal level for the mic input . So we need to reduce even this output by 40dB, or by a factor or 100. The other common output often used from a mixer is the headphone output. Some calculations reveal this can have a level between -9dBV to +4.77dBV, depending on the signal level and headphone volume control. This should be used only as a very last resort, and then still using at least a 40dB attenuator. Having a range of attenuators, or a variable attenuator is useful. However a 40dB attenuator will assist in most situations. So what is a 40dB attenuator, and how do you make one? Simply put, a 40dB attenuator reduces (attenuates), or divides the signal by a factor of 100. Most music shops will sell what is often called a DI box. The DI stands for Direct Input, or Direct Injection. Either way, it is simply a box which allows instruments (like keyboards and guitars) to be directly plugged into the microphone input of a mixer. These DI boxes also change the signal to a balanced line to be able to run a longer microphone lead (more on this in a coming article). 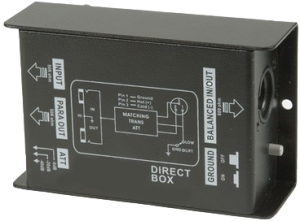 Many DI boxes have a switch which will enable you to select -40dB, -20dB or 0dB attenuation. 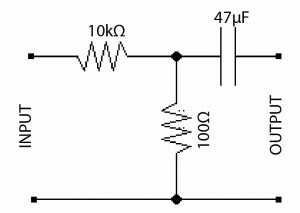 This circuit simply divides the input which makes the output 1/101th of the input. It can be made up by anyone who knows a little about electronics and can solder. Similar circuits appear in any number of forums with slight variations. They should all work. The capacitor is used to block any DC voltage coming from the camera or from the mixer, it is not always needed. built into a 6.35mm (1/4?) plug (this plugs into the mixer – you’ll need a 3.5mm (1/8?) plug for the mic input). Don’t forget to fit the plug cover on the cable before soldering the resistors and plug on. This doesn’t use the capacitor, but you could fit it in the plug at the other end of the cable if required. If you want make an attenuator with a different attenuation, use can use my simple decibel calculator for audio. I hope this has helped in understanding levels and decibels, and the why and how of connecting line level to microphone inputs. Notice how the Tangent line length goes between 0 and infinity as the angle goes from 0 to 90. What they mean and how they’ve steered innovation. Pivotal points in the past few centuries saw human innovation advance in leaps and bounds, and all thanks to physics. Cathal O’Connell explains the equations and how they transformed history. They place limits on the possible, as in the efficiency of an engine, and they reveal possibilities we could never have imagined, such as the energy inside an atom. Occasionally over the past few centuries, a new equation endowed the next generation with a new magical tool, and so changed the course of history. Here are some of the most pivotal. It’s easier to push an empty shopping cart than a full one. Together with Isaac Newton’s other two laws of motion (the first says you need a force to move something, the third says every action has an equal and opposite reaction), this equation forms the foundation of classical mechanics. F=ma allowed physicists and engineers to calculate the value of a force. For instance, your weight (measured in newtons) is your mass (in kilograms) multiplied by acceleration due to gravity (on Earth, about 10 metres per second squared). Saying you “weigh” 60 kilograms is incorrect in physics terms – your actual weight is about 600 newtons. This is the force pushing down on your bathroom scales. This equation was crucial to the arrival of the mechanical age. It’s used in almost every calculation which involves using force to cause movement. It tells you how powerful an engine needs to be to power a car, how much lift an aircraft needs to take-off, how much thrust to lift a rocket, how far a cannonball flies. Any two massive objects pull on one another across space. But the force decreases rapidly the further apart they are. We’re stuck to the Earth’s surface because our planet is comparatively big with lots more mass. For centuries, the Universe had been divided into two realms – the earthly and the celestial. But Newton’s law of gravitation applied to everything. The same tug that causes an apple to fall from a tree keeps the Moon orbiting the Earth. Newton gave us the first direct connection between everyday life and the movement of the heavens. For a long time, the equation’s main use was to calculate the orbits of planets. The space-age of the 1950s and 60s saw it used in practice – to send satellites into orbit and astronauts to the Moon. One failing, which Newton himself admitted, was that he did not know “why” gravity operated. It took nearly 230 years for Albert Einstein to come along and explain gravity as arising from the warping of spacetime by massive objects in his theory of general relativity. Even so, general relativity is only used in extreme situations, such as when gravity is very strong, or when great precision is required, such as for GPS satellites. In most cases Newton’s 330-year-old equation is still good enough. Entropy (a measure of disorder) always increases. It’s no good crying over spilt milk. Disorder and mess are inevitable in the Universe. While trying to analyse steam engine efficiency in the 19th century, French physicist Sadi Carnot stumbled upon one of the most profound equations in all of science. It tells us some processes are irreversible, and may even be responsible for the arrow of time. In one of its simplest forms, it says heat always travels from a warm object to a cold one. It can also be applied to the grandest scales. Some have applied it to describe the ultimate fate of the Universe in the form of “heat death” where all the stars are burnt out and nothing’s left but waste heat. Others have used it to wind back through time and describe the origin of the Universe in a moment of zero entropy (or perfect order) at the instant of the Big Bang. This law was important for developing technologies of the industrial revolution, from steam to internal combustion engines, to refrigerators and chemical engineering. In real engines, some energy is always wasted – so the law also showed any efforts at perpetual motion were ultimately futile. You can create a changing electric field (left side of the equation) from a changing magnetic field (on the right) and vice versa. Electricity and magnetism are related! In 1831, Michael Faraday discovered the connection between two natural forces, electricity and magnetism, when he found a changing magnetic field induced a current in a nearby wire. Later, James Clark Maxwell generalised Faraday’s observation as one of his four fundamental equations of electromagnetism. This is the equation that powers the world. Most electric generators (whether in a wind turbine, coal-fired plant or a hydroelectric dam) work by converting mechanical energy (from steam or water) to rotate a magnet. By running this process in reverse, you get the electric motor. More generally, Maxwell’s equations are still used in almost every application of electrical engineering, communications technology and optics. Mass is really just a super-condensed form of energy. Because of the size of the constant in the equation (the speed of light squared, an unimaginably huge number) a colossal amount of energy can be released through converting a tiny amount of mass. Einstein’s most famous equation hinted at the potential for the huge amounts of energy released in nuclear fission, when a large unstable nucleus breaks into two smaller ones. This is because the mass of the two smaller nuclei together is always less than the mass of the original big nucleus – and the missing mass is converted into energy. The “Fat Man” atomic bomb dropped over Nagasaki in Japan on 9 August 1945 converted just one gram of mass to energy, but produced an explosion the equivalent around 20,000 tonnes of TNT. Einstein himself had signed a letter to US president at the time Franklin Roosevelt recommending the atom bomb be developed – a decision he later regarded as the “one great mistake” of his life. It describes how the change of a particle’s wavefunction (represented by psi, the candlestick shaped symbol) can be calculated from its kinetic energy (movement) and its potential energy (the interactions on it). It’s the quantum version of F=ma. When Erwin Schrödinger formulated his equation in 1925, it placed the new theory of quantum mechanics on firm footing by allowing physicists to calculate how quantum particles move and interact. In one of its simplest forms, it describes the structure of the atom, such as the arrangement of electrons around the nucleus, and all chemical bonding. More generally it’s used for many calculations in quantum mechanics and is fundamental to much of modern technology from lasers to transistors, and the future development of quantum computers. Cathal O’Connell is a science writer based in Melbourne. the world of the very small.